The Hobbit held up a little better than I’d expected it to last week, taking in $18.7 million to boost its 10-day China total to $37 million. But three new foreign entries—Les Miserables, Stolen, and Dredd—managed to gross only $8.5 million between them, continuing the dispiriting downward trend of U.S. and foreign films there even as China sets new box office records virtually every week. In contrast to last year, when Hollywood films ruled the charts nearly every week for the first half of the year, Week 9 was the first time in 2013 that foreign films earned a 50 percent weekly share, which they barely achieved at that. With $58 million in total receipts for the week ending March 3rd, aggregate box office was up by 87 percent over the same session last year. Total receipts through the first nine weeks of 2013 are now 46 percent higher than for the same period in 2012, but total revenue for major U.S. studio films remains stubbornly down by nearly 50 percent year-to-date. The highest profile debut of the week was Les Miserables, which mustered a soft $4 million over its 4-day opening frame. Given its limited number of screenings and Chinese audiences’ traditional aversion to musicals, this may be as much as the film’s backers could have hoped for. But for many Chinese commentators it was a downside surprise, since Les Miz performed well in several other Asian territories. I’m expecting a final gross in the $9-10 million range. Journey to the West maintained its top ranking for the fourth straight week, a nearly unprecedented achievement in China, extending its gross to $181 million, the third best total ever after Avatar and Lost in Thailand. Hobbit’s respectable second-week gross puts it on track toward a final gross in the mid- to high 40 millions, possibly even $50 million, when its China run is through. Even so, it will finish as one of the lowest indexing Hollywood releases in China of the past year. In fact, no Hollywood release in China this year has come anywhere close to performing at the level of last year’s average Hollywood film. 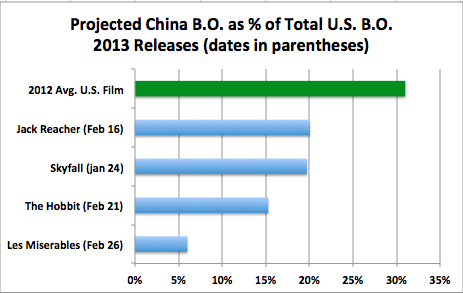 In 2012 the average U.S. quota film grossed about a third in China of what it did in North America. Given China’s extraordinary growth of the past year, one could reasonably expect U.S. films this year to earn an average of 40 percent of their U.S. total in China, but as the chart below shows, 20 percent has been the high water mark so far. Given the discouraging trend, what’s a U.S. distributor to do? Tomorrow I’ll take a look at a current case example for doing things right. This entry was posted in Box Office Reports, Opinion and tagged China box office, Dredd, Journey to the West, Les Miserables, Rob Cain, Robert Cain, Stolen, The Hobbit: An Unexpected Journey by chinafilmbiz. Bookmark the permalink. Interesting article…as always. Surely the country of origin for The Hobbit should be New Zealand? Thank you for your note. Of course we all know, thanks to the great job you do promoting it, that The Hobbit is a New Zealander. But it’s often a messy challenge with cross-border productions to figure out how to attribute a film’s country of origin. For the purposes of this column I’m going with the traditional approach of attributing the film to the studios and money people behind it, which in this case are New Line Cinema and MGM.